O-Mazing: Matusz Shines, Pie Hits Another Out..
After yet another deflating loss to the Indians, thanks to the bat of Andy Marte, the Orioles thanks to their young talent, turned it on. In the end, Baltimore beat Cleveland, 5-3, as Brian Matusz had his best showing on the mound to date throwing seven innings, striking out eight, and giving up a run, while Felix Pie continues to show why Andy MacPhail was so tnrealled with him in the off-season as he hit a two-run homer. Baltimore took a 4-0 lead in the third inning as Ty Wigginton scored on an error, and Pie hit an opposite field homer -- a two run shot. A few moments later, Luke Scott added an RBI-single. They added another run in the sixth inning via a sacrifice fly by Brian Roberts. Cleveland got their first run in the sixth as Grady Sizemore opened up the inning with a triple and then scored on a Jamey Carroll RBI single. They added another run in the eighth off Danys Baez as Shin-Soo Choo plated in a run with an RBI-infield single. The Orioles got their 54th win of the season; however, the story of the day has to be the success of Brian Matusz -- who really has only less than a year in professional baseball -- has stepped it up and delivered at the highest level today and Felix Pie. After losing a heartbreaker on Thursday night, the Orioles regrouped and absolutely smashed the Cleveland Indians, 13-4. Big nights by Felix Pie (three RBI's, and a homer), Nick Markakis (three hits with a homer, with three runs driven in) and Matt Wieters (three hits, four RBI) helped propel the Orioles to their 53rd win. Jason Berken benefitted from the deluge of the Baltimore offense and earned his fourth win of the season. He went five innings, allowed two runs, walked three and struck out five.Here are some photos from the game, and as well click on the link for more images. Jim Johnson has been suitable in relief this season; however, his 2009 campaign is lacking some of the brilliance from last season, and once again – last night – he served up a homer in a relief outing. This time around, it made the difference in a razor thin ballgame. Baltimore was within one out of grabbing a win against Cleveland – a team that has played well in the second half despite offloading Cliff Lee – but after giving up a single to Matt LaPorta, Andy Marte golfed a two-run homer that barely got over the left field wall to give them a 5-4 lead. Watching on TV, the ball hit by Marte actually looked catchable, as it didn’t have much lift over the wall (which is only 7 feet high) – assuming Reimold was in the vicinity of where it was hit. Reimold – to the best of ability – rushed over track the ball; however, it was to the left of him. Baltimore rallied and got two men on base – Felix Pie beat out an infield single, and he ended up on third after a Reimold base hit—however, closer Kerry Wood struck out Nick Markakis with a breaking ball close to the dirt and ended the game. Kerry got his 17th save on the year, while Rafael Perez – who pitched in relief – got the victory for the Indians. Johnson, gave up the game-winning homer – took the loss. For the first time in a quite a while, Jeremy Guthrie looked like a stopper as he pitched seven solid innings, only giving up a run, as he the Orioles finished off the Twins, 5-1. Overall, it was a solid effort by the team, and instead of finding themselves in an another close game that would end up in a loss, they put their opponents away early and for good. Guthrie – the defacto ace and lone veteran in the starting rotation of the Baltimore Orioles – has struggled mightily this year with his command and the gofer ball; however, he was effective on the mound and focused. Minnesota scored only in the fourth inning off a Justin Morneau RBI-double; however, they were not able to do much more damage than that. Baltimore jumped on Minnesota starter Nick Blackburn in the first inning as Nolan Reimold drove in a run with an infield single, and then they scored again thanks a throwing error by Orlando Cabrera to first base that plated Luke Scott. Jerry Crasnick of ESPN -- who I enjoy reading during a lull in a my workday (I really don't have too many of those anymore) -- wrote a piece recently on nine men whose performance during the final six weeks or so of the 2009 MLB regular season will determine how their futures will be shaped. After the Orioles lost on Monday in the Land of 10,000 Lakes in a tight game, they took an early lead, but gave up another one to the Twins on Tuesday, 7-6. Delmon Young had a walk-off hit in the ninth to seal it for Minnesota off rookie reliever Kam Mickolio – who had been lights out until then. Mickolio got both Joe Mauer and Justin Morneau to ground out to start the final frame, and need one out to finish the game; however, Michael Cuddyer hit a hard grounder to Brian Roberts – however, it skipped through the second baseman’s glove – off Mickilio, and then Jason Kubel got on base with a single. Moments later, Young’s hit ended the game. Brian Matusz had an up and down start as he went five innings and allowed three runs, and didn’t factor in the decision. Mickolio took the loss. The game was close; however, the young Oriole pitchers learned this – giving up walks and not getting crucial outs will kill you at the major league level. The game also put the glare of a critical eye back on Felix Pie – who has been nothing but solid for the past few weeks, and has looked very promising with increased playing time and the injury to Adam Jones. He had two notable base running gaffes – the most notable one in the sixth inning as he got involved in a run-down after a shallow flyball to first base by Nolan Reimold and Morneau was definitely paying attention. Pie was 1-4 at the plate; however, he must have left like crap after the game and he has to be much better on the basepaths, plus use his baseball instincts – assuming he’s at least par with them – much more judiciously. Last night, Oriole rookie Chris Tillman learned how difficult life can be in the majors at times. The youngster pitched well and show why the Orioles have been so high on him; however, despite his solid start, the offense could not get anything going, and in the end, Baltimore lost to Minnesota, 2-1, to kick off a three game set. Minnesota used an RBI-single by Denard Span and a sac-fly by Jason Kubel to fnish off Baltimore in the bottom of the sixth inning. It looked like the Twins were too struggling at times in the batter's box, but they came together at the right time and made Tillman -- who was beginning to struggle in the frame. Chris Tillman pitched 5 1/3 to take the loss and was charged with two runs. Mark Hendrickson came into relieve Tillman and get the Orioles out of a tight spot; however, he gave up the sactifice to the Twins' Kubel to decide the game. Baltimore's only run came in the second inning as Brian Roberts -- perhaps the hottest hitter on the squad -- plated Michael Aubrey with an RBI-double; however, that was pretty much all the offense they could muster after that. Minnesota's Scott Baker earned the victory as he went seven innings, and was charged with a run. Closer Joe Nathan got his 32nd save, but the Orioles did make things interesting as they got two men on base thanks to back-to-back walks; however, Matt Wieters struck out to end the game. Well, this is the last series that the Orioles will ever play in the Metrodome as the Minnesota Twins will be opening up Target Field -- an open air stadium -- in 2010. I've been to the Metrdome three times -- twice for baseball during trips, and once for NCAA Basketball -- and while it may make for quite an environment for basketball and football due to the domed structure, it is awful for baseball. I don't care for domes in baseball, and I truly believe that all stadiums/parks in the sport should be played on grass, plus fans should be able to see the sky. Despite Baltimore’s record, all things considered, they have been playing well the last week or so. Their solid play continued in Chicago as they took two out of three from the White Sox this weekend, as Jeremy Guthrie found his groove on Saturday, and Jason Berken showed signs of learning on the big league level as he won his third game of the season. With Aubrey Huff being traded last week, one wondered who’d step in and take up the slack; however, Brian Roberts has taken torch as he’s been a doubles machine, and has supplied much of the team’s offense. In addition, Nick Markakis has started to pick up the slack, and after a dip in his numbers, Nolan Reimold is starting hit the ball well again and contributed to Sunday’s win with his 12th homer of the year. Furthermore, Felix Pie – the one guy who everyone wanted off the team – has finally gained some comfort as an Oriole as his playing time has increased; therefore, he’s responded. He had a homer on Sunday, and has been able to get timely hits when needed to help out the squad. After barely hitting his weight for much of the year, he’s upped his batting average to .259 and has shown flashes of the player he was in the Chicago Cubs minor league system. Right now, in my mind, the big picture should be on the development of the pitching – which has improved somewhat since the All-Star break – and looking to add pieces for next year. Kam Mickolo – at least when I have been able to watch him briefly on MASN – has done remarkably well in his latest tour in Baltimore and may now be here to stay with Sherill traded and with Johnson serving as the current closer. Orioles Salvage Series in Tampa; Are Things Getting Any Better? The Orioles finally snapped out a five game losing streak as Brian Roberts hit a grand slam in fifth inning and Nolan Reimold followed up with a three-run shot of this own in to led them to a victory over the Rays, 8-7. Brian Matusz earned his second major league win as a he looked solid on the evening. He went 5 1/3 innings and allowed four runs on seven hits, and struck out seven batters. He got knocked out of the game as Ben Zobrist took him deep, and while the Oriole bullpen held their own, things got a little scary in the eighth as Tampa scored three more times to come one of the lead, 8-7; however, closer Jim Johnson got a four-out save, his fifth to save it for Baltimore. The Orioles are now 9-24 since the All-Star, and it's needless to say that well, they are struggling; however, in spite of the losing, the young pitching seems to be improving as both Jason Berken and Chris Tillman had decent starts in game one and two, respectively. Right now, the Orioles are 49-72 and while that record doesn't inspire much as a fan for me at all -- at least the team isn't using veteran retreads and have pieces for the future in their lineup. With four rookies in the rotation -- all who have seen the ups and downs of major league life -- the Orioles are looking more like the Nationals than the Rays, but I still do have reason to believe that the future is far better than the present right now. After Sunday’s horrific loss in extra innings, the Orioles hoped to split the four game set with the Angels; however, they found themselves on the losing end – again – as Vladmir Guerrero hit two homers, drove in five, and gave a huge lift to starter Ervin Santana as Los Angeles defeated Baltimore, 8-5. The game was close until the sixth inning, as the score was tied at two, but the Angels made Baltimore starter David Hernandez pay for a few mistakes. Macier Izturis started off the frame with a solo shot, then Guerrero smashed a long two-run homer that put Los Angeles up, 5-2. Guerrero struck again in the following inning as he hit a three run shot off reliever Cla Meredith to put the Angels up, 8-3. Baltimore put up a nice rally in the 9th inning thanks to a Melvin Mora homer; however, closer Brian Fuentes put out the fire and Los Angeles earned the win. Brian Fuentes got the sav e – his 34th. The Orioles could not match up offensively at all with the Angels on Monday night; however, Nick Markakis hit his 15th homer in the bottom of the sixth inning, and also drove in a run with an double in the third inning. Adam Jones drove in a run with a groundout in the first inning. The Angels took a 2-1 lead as Kendry Morales hit his 26th home run in the second inning – a two run shot. The Orioles as we all know traded away Huff yesterday before the game; therefore, Luke Scott took over at first and looked fine there – then again, he didn’t get any challenging plays at first. I guess one could say that the team is evaluating the talent – rookie and veteran – to see what works and does not. Terms of the deal were not disclosed, but according to MLB Network and multiple reports it's a four-year contract worth more than $15 million. That exceeds the previous record, the $10.5 million right-hander Mark Prior received from the Cubs after the 2001 Draft. Strasburg is expected to be introduced at Nationals Park either Wednesday or Thursday. The Nationals feel strongly that Strasburg can make an immediate impact in their rotation, maybe joining the team's Major League roster sometime in September. If he is promoted to the big leagues this season, Strasburg will become only the third pitcher in baseball history to be drafted No. 1 and play in the Majors in the same year, joining Rangers left-hander David Clyde in 1973 and Orioles right-hander Ben McDonald in '89. After staging thee comebacks -- including scoring twice during the eighth and ninth innings -- what could have been a very memorable became a disaster of epic proportions as the Oriole bullpen (Matt Albers and Brian Bass) gave up nine runs in the top of the 13th inning and lost 17-9. I have no idea what to even think about this loss, it was awesome to see the team fight, and then to see Baltimore lose so badly -- moreso, tragically -- considering the tightrope that they faced in the final few innings left you deflated. Then again, the Los Angeles Angels -- first place in the American League West -- are a tough team with almost everyone in their lineup batting close to .300 or above; therefore, if a pitching staff screws up, it's open on season on theit hurlers. The Orioles have traded first baseman Aubrey Huff to the Detroit Tigers for Single-A pitcher Brett Jacobson, a 6 foot 6 reliever who was 1-3 with a 3.74 ERA in 35 games at Single-A Lakeland. He was drafted in the fourth round last year. More to come. The Baltimore Sun has more on the deal and it looks like Luke Scott will be starting at first base tonight. I'm not surprised that he was traded only for the fact that he's going to be a free agent at the end of the season; furthermore, I don't think he was going to be re-signed in Baltimore unless he accepted arbitration.Well, Huff has some value to a contender who needs a left handed bat, plus, he gets into the thick of a pennant chase and may find himself in the playoffs. The Orioles in making this trade are simply perhaps looking for more depth -- especially arms. On Sunday night, baseball fans, kids, parents and strong contingent of Oriole players and staff got together at the ESPN Zone in Baltimore's Inner Harbor for the 4th annual "Brian's Baseball Bash" to benefit the University of Maryland Hospital for Children. The popular restaurant was seemingly filled to the walls with people -- several hundred or so -- for the sold-out event that was far more laid-back and friendly; thus, it gave a chance for ardent Oriole fans a-once-in-a-lifetime chance to meet and mingle with their favorite players for three hours or so. Walking the event, you could see Brian Roberts mingling with fans and well-wishers, or if you traveled a few feet in front of you, Nick Markakis signed anything and everything; meanwhile, if you ventured upstairs, Orioles hurler Jeremy Guthrie was taking all-comers in basketball, and only a few feet away, you saw Jim Palmer and Dave Trembley at a bar minging with fans, taking pictures and signing autographs. Or if you turned in another direction, you saw Chris Ray playing games, Danys Baez chatting it with a small kid or uber-prospect Matt Wieters meeting a throng of people. There was also an impressive display on the main floor with autographs of who’s who of baseball – stuff from Alex Rodriguez, Ichiro Suzuki, Ryan Zimmerman and more – to bid on, as well as a live auction later on the event selling memorabilia and opportunities to learn from the pros on the team with one-on-one lessons. As far as the eye could see, there were players, fans and a ton of food laid out immaculately everywhere; however, Brian’s Baseball Bash is more than admirers celebrating their favorite players or getting an autograph or a picture, it’s all about a larger and vital cause -- improving the lives of sick children in the greater Baltimore metropolitan area and in the state of Maryland. Photos from Friday Night -- Felix Pie Hits for the Cycle..
On Saturday, the Los Angeles Angels of Anaheim defeated the Baltimore Orioles, 5-1, as they used a huge five-run third inning to secure the victory. He was lights-out in the first two innings, but walks -- including a base loaded one to Vladmir Guerrero -- along with a groundout that plated two runs and a single made the difference. Former Orioles Dave Johnson, Mickey Tettleton, Dave Schmidt and Mike Deveraux signing autographs for fans outside the 'Bud Light' warehouse on Friday night. Former Oriole Mike Deveraux speaks with Tom Davis and Dave Johnson during the Orioles pre-game radio show at the 'Bud Light' Warehouse Bar on Eutaw Street. Former Orioles catcher Mickey Tettleton chats with fans right in front of MASN's "O's Xtra" outdoor studio in the centerfield picnic area. It was one of the more memorable nights with my fandom in a very long time. On Friday night, the Orioles absolutely annihilated the American League West leading Los Angeles Angels, 16-6 as Chris Tillman won his first major league game and the offense finally broke after a prolonged slumber. However, the story was Felix Pie as he hit for the cycle and had nothing short of a career night. As most Oriole fans know, Pie was given the starting left field job and struggled for the two months of the season, therefore, he was soon regulated to the bench. However, for the past several weeks, when Felix has played, he's produced, but I don't think envision that this guy accomplish this feat -- especially considering that he was more or less fighting for a roster spot awhile ago. Camden Yards might have been more slightly half filled last night, but the crowd gave Pie after his triple -- rightfully so, a standing ovation and a nice applause. I'm glad the Orioles didn't give up on him, and let him work out his issues. He's succeeded in the minors, and perhaps on Friday, we all got a glimpse as to what he can be. It's the second half of the season, and with football coming around the corner, it looks like it's the same old story with the Orioles. After winning 3-2 last night against Oakland and giving David Hernandez his fourth major league win, the Orioles behind Jason Berken struggled again. In the end, Oakland beat Baltimore, 6-3, thanks to a huge 4th inning and taking advantage of Berken leading him to his 10th loss of the season. Once again, they were killed on the afternoon thanks to a lack of hitting, focus in the field, and minor lapses that gave the A's opportunities to score. I just watched some of the game online, and it goes without saying Baltimore could have played a lot better. As much as I have said, I want to see the young players develop -- and they have been doing a decent job considering the circumstances -- it's hard as a fan to watch the Orioles lose night and night out. The Orioles are not doubt trying -- seriously -- but perhaps a tough season, a lack of talent, and the every day doldrums are leading this team down a losing path. Really, I don't care about a winning season right now, I just want to see improvement. If there's any positive, we're doing it with youth and men who could be a part of the future in Baltimore, not your retreads. Rather than write much about what happened this weekend, as we all know what transpired (Berken finally snapped his losing streak, but an extra inning loss on Saturday, Matusz getting lit up on Sunday, plus a laugher against the A's last night) made me think about things in general. With 50 games left, the question I guess that needs to be asked amongst all of us fans is this: are you happy with the team's progress, cynical, frustrated, or just don't care? Really, I'm looking forward to seeing much of the young talent -- Jones, Matusz, Wieters, Markakis, Bergesen (if we see him anytime soon), and whoever else -- play throughout the season and follow their development. What do you all want to see happen during the last seven weeks or so of the season with the Orioles? What are you looking forward to in 2010? Anyone you want to see signed? Players that need to be sent on their way? After a tough loss on Wednesday night, and a thrashing on Thursday at the hands of the Detroit Tigers, the Orioles are roughly 2/3 or more through the season and with the state of the team, what's really left to pay attention to? As it is, the Orioles are heading to their 12th losing season, at least, we get to see the young pitching come up and see who can stick at the major league level, and who doesn't have it. However, with all the optimism, the veteran on the squad -- Jeremy Guthrie -- may have had his poor season and his overall circumstances get to him this week. One day after skipping out on his media responsibilities, Jeremy Guthrie set out to make things right. Guthrie, who had elected not to speak after his start against the Tigers on Wednesday night, made a beeline to reporters on Thursday morning and issued a heartfelt apology off the cuff. "I'm apologetic for not making myself available," he said, "when obviously it was a game in which I pitched and needed to make some comments, to talk about how well the team played. I think we played really, really well defensively and we got shut down by a really good pitcher who was on top of his game." Guthrie, who had never missed an interview before, said that he understood that he had a responsibility to his fans, and more to the point, that he sets an example to Baltimore's quartet of rookie starting pitchers. The right-hander said frankly that he understands that speaking after his starts is part of his job. "Ultimately, I was hoping to take a night off," he said. "And looking back on it, it was not the right decision, especially in this circumstance. I guess my regret is that I did it and it was kind of misinterpreted. Hopefully, going forward, I anticipate making myself available for all the standard times that we have to be available." One can understand Guthrie's -- or anyone's frustration -- at how 2009 has gone; however, one has to be a professional and accountable not only to the media, but to the fans who pay to watch them. Over the past few seasons, the second half for the Baltimore Orioles has usually become a wasteland, full of bad baseball, sometimes uninspired play and knowing the team will finish up poorly. The 2009 Baltimore Orioles will surely not see the playoffs, or even in 2010, but it looks like Andy MacPhail's plan is starting to pay off. Instead of a roster filled with past-their-prime players, the Orioles have given their youngers a chance to succeed at the highest levels, and perhaps a star was born last night. Out of opportunity comes hope, and with Bergesen's injury along with Rich Hill's, guys now have a chance to step up. Last night, highly touted Brian Matusz -- who has only been in professional baseball all of a year -- started his first game ever in the majors and walked out a winner as the Oriole offense and key plays plus big hits by Cesar Izturis led them to victory over Detroit, 8-2. Aside from earning their 45th win in 106 games, Matusz showed that he has the poise and stuff to become a quality major leaguer. He went five innings, threw 99 pitches, gave up six hits, walked three and struck out five. While Matusz did not look like Nolan Ryan out there, and a few of his balls that were hit -- if the Orioles didn't play cavernous Comerica Park on Tuesday -- could have been potential homers in most other parks, he got guys out and mixed up his pitches really well. Clete Thomas crushed a solo homer to center with two outs in the last of the ninth off reliever Danys Baez as the Baltimore Orioles lost the opening contest in a four gane set to the Detroit Tigers, 6-5. Chris Tillman was shaky in his second major league start, as he allowed five runs in six innings. Despite Baltimore taking a 5-run lead over Detroit in the opening frame off ace Justin Verlander, the Tigers seemed to chip away at their lead throughout the evening and jumped all over Tillman. Much-talked about pitcher Brian Matusz makes his major league debut tonight and it will be exciting to if he can translate his minor league success onto the big stage; however, much of the attention yesterday about the Orioles was focused solely on Mora's ill-thought out comments and Trembley (they have since chatted and made up). We've already talked about Mora, therefore, I would like to bring up Dave Trembley and the job he's doing for the Baltimore Orioles. Obviously, most of us don't know what goes in the clubhouse, but with the news of this weekend, one has to wonder how tenuous - if at all - Trembley's job situation may be. There are some who have criticized the skipper for his game management, along with some of the foibles that have happened on the field, but you cannot blame the failure of the 2009 Orioles on him. After losing 4-0 to Josh Beckett and the Red Sox on Saturday night, the Orioles continued their swoon as they lost 18-10 to the Red Sox on Sunday. Although the Baltimore offense came alive and they had a six-run rally in the third inning, it was just plain bad baseball on the afternoon at Camden Yards. The pitching sucked, Aubrey Huff was shaky at first, and hitting into double plays killed the Orioles. One has to figure that Jason Berken may still be around next week in Birdland with Bergesen on the DL, but if Brian Matusz -- who will start on Tuesday -- delivers at the Major League lebel, he's good as gone and back in Norfolk. I'm a tad surprised that Matusz is going to pitch in the majors much sooner than expected, and more so considering how conservative the Orioles have been with their young starters; nevertheless, they need help. The kid has dominated in the minors, and has stepped it up this season, so why not give him the opportunity and see if he's hungry. I might have preferred to see a Chris Waters or David Pauley come up with the big squad if a spot opened up, especially if they were need for a start or two, or three, but let's see what Matusz can do. Finally, the biggest story aside from the sad loss to Boston might have been the words out of Melvin Mora's mouth and I'd be surprised if he's still on the squad in the near future. From MASN Sports: Melvin Mora stood in front of his locker with his arms folded earlier today and expressed his frustration to the print and electronic media over losing his playing time. It was a close, sometimes crazy, thrilling contest, but when the dust settled, the Boston Red Sox emerged victorious over the Baltimore Orioles, 6-5, to open up a three game weekend set. Kevin Youkilis’ homer – a two-run shot that gave the Red Sox a 6-5 lead -- off Baltimore starter Jeremy Guthrie in the seventh inning made the difference on the evening. Guthrie (7-10), who gave up three home runs, took the loss and gave up six runs on nine hits in 6 2/3 innings. John Smoltz (2-4), who started the game on the mound for Boston, earned his second win of the season as he went six innings and gave up five runs. Smoltz was not pretty at all on the mound; however, his offense came through when he needed it and that made the difference. Jonathan Papelbon earned the save, his 27th and 23 saves in 24 chances against Baltimore. Boston scored first as Nick Green made the score 1-0 as he drove in a run with a sacrifice fly, and an inning later, David Ortiz raised the score to 3-0 as he hit his 15th homer of the year – a two run shot. Baltimore scored three times in the bottom of the third inning as Nick Green’s error allowed a run to come through, and then Nolan Reimold hit an opposite field two-run homer – his 10th – to the game. Terry Francona and the Red Sox tried to argue the call as Reimold’s home run seemed to hit the top of the fence; nevertheless, the umpires met to review the play, and minutes later, the original call was upheld. 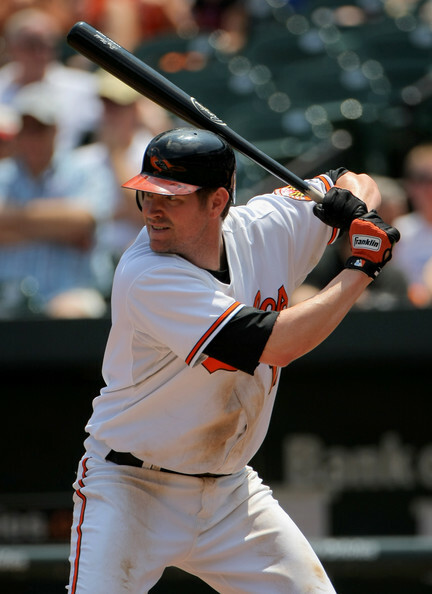 The Red Sox made the score 4-3, as Jacoby Ellsbury hit a solo home run – his 6th; however, Baltimore took the lead back in the sixth inning as Aubrey Huff hit his 12th homer – a two run shot and 200th of his career – that put them up 6-5. The play of the game came in the bottom of the sixth inning. After Huff hit his home run, Luke Scott seemed to follow up with a shot of his own that was aimed a little above the Southwest Airlines sign in center field. However, out of nowhere, the speedy Ellsbury left over the wall and robbed Scott off a sure home run.